There are some books that I pick up and know right away that I need to own a copy. I know when I walk into the hall and share the book with colleagues, they too will want to own a copy. And I know that if I buy a copy and put it in my classroom, I may never see it again as the children will circulate it among themselves for months. 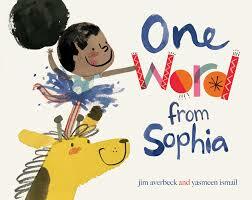 This is how it's been with One Word from Sophia by Jim Averbeck (@jimaverbeck) and Yasmeen Ismail (@yasmeenmay). Sophia is a little girl who is getting ready for her birthday. She wants one thing for her birthday--a pet giraffe. She wants one VERY badly and tries to convince everyone she can that she should have one. She uses slide shows, maps, graphs and more to try to convince her family that she should have a giraffe. There is so much to love about this book and so many possibilities for the classroom. First off, it is a fabulous read aloud. We read this as a #classroombookaday just for fun. It is a great story with a great character and the language is so engaging! Not only is Sophia engaging in the way she tries o convince her family of her true desire but her parents responses have invite some great conversations around vocabulary too. I plan to revisit this book during our persuasive writing unit later this year as Sophia has persuasive skills like no other picture book character I know! And if you want even more ways that this book can invite quality conversations, you can read this SLJ article and see how Paul Hankins plans to use it with his high school students. You'll definitely want to check out this book as your kids will love it (whether they are 5 or 15). It is one of those books that I think we'll revisit often and find some new amazing thing each time. You can read and watch more about the video on Simon and Schuster's site. And make sure to visit the other stops on the ONE WORD FROM SOPHIA blog tour! Loved this book! I would definitely have used it with my 6th graders since we did a WOW (word of the week). So many great vocabulary words in this book. I love the way each character is so distinct and individual! A celebration of words and family! I'll have to check this one out next time I'm at the bookstore.